A swimming pool is a superb addition to your home. It adds to the aesthetic appeal of your home as well as provides an amazing place to relax and enjoy with your family and friends. In addition, a good swimming pool in your compound will add to the value of your home. Considering that a swimming pool is a long term investment, you should take time to ensure that you choose the right type. Installing the right swimming pool in your home will enable you to enjoy all the benefits of a swimming pool such as comfort and safety. A fiberglass swimming pool can be a great option. Fiberglass pools are becoming increasingly popular in the contemporary world for a number of reasons. One of the biggest reasons is the fact that these types of pool are easy to use. In addition, they are easy to set up and also require minimal upkeep. Fiberglass pools are also less costly as compared to other pool varieties. Even though a fiberglass pool is a great option you have to ensure that you have installed it properly. Here are 5 key elements to a successful fiberglass pool installation. This is one of the aspects that lead to failure of many pool installations. When laying the foundation, the area should be brought up to grade with a compactable base material. This is because if this is not done,then the ground will ultimately settle and so will the pool. Additionally, if the base material is not properly compacted, the pool will settle over time and this will be disastrous. To avoid these problems at a later date, ensure that you hire professionals who will ensure that the pool rests on a solid foundation. A fiberglass pool is a one piece unit and as such it isn’t perfectly leveled. The pool can be up to one (1) inch in forty (40) feet according to the industry standards. For the best results, ensure that the professional you are working with will use sound pool leveling methods to level the pool shell. 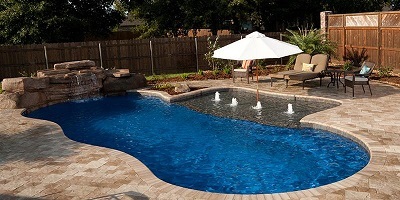 One of the best and most effective methods to level the fiberglass pool is to completely lift it out of the hole and add or remove material to get the pool to the desired level. Sound plumbing should be done when installing the fiberglass pool to avoid leaks. There are 3 essential things that the installer should do in order to protect the pool against leaks. These are: secure the plumbing to ensure that it doesn’t move, use rigid PVC pipe, and pressure testing. Rigid pipes are the best because they are durable and can be contoured to follow the pool shell. Pressure testing is extremely important so that if there is any leak it can be fixed before putting the concrete patio. Backfilling if done improperly can have serious consequences. When backfilling, ensure there is relatively equal pressure on the walls of the swimming pool. Also, compact the backfill material to ensure minimal settlement. When backfilling is done improperly, it leads to bulged and crooked walls, excessive settlement, and sagging steps and benches. A perfect pool installation can be ruined if the coping of the swimming pool is of poor quality. In essence, coping can either make or break the entire installation process. Cantilevered concrete coping should be poured on top of the pool as the final step of the installation process. This should be done by a highly experienced and competent professional. A good and sound cantilevered coping should be free of substantial air pockets and exposed gravel. Furthermore, the surface should be uniform and relatively smooth. For best results, devote your time and efforts in getting the right pool contractor as well as the right pool manufacturer. The last thing you want is to invest your hard-earned money in a good pool only to be ruined by incompetent pool contractors. You can get recommendations from your family and friends or check online platforms. Read customers’ reviews and feedback and only deal with a reputable and reliable contractor.